rebekah price: Rebekah Price...Oklahoma City, Oklahoma. *NOTE: all overlays generously sponsored by eyecandy overlays. hi. 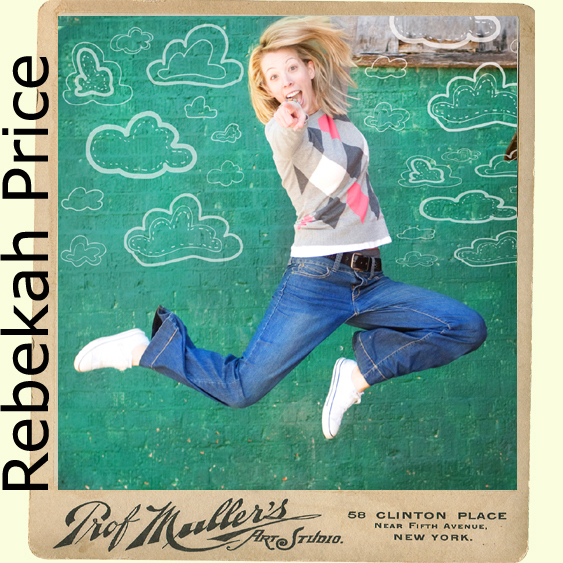 i'm rebekah...the girl who loves to create! give me some paper & glue or some paint and a thrift shop and i'm good to go. and i can't forget my camera because i LOVE capturing moments and portraits as well. oh but wait...i'll also toss a few cartwheels or flips in between since my regular gig is as a gymnastics coach. 1. my family...is an inspiration to me. i'm so thankful for those God has given me in my life. 2. you can find me...smiling and enjoying every day. a grateful heart keeps away negative thinking, right?! 3. my inspiration...comes from all kinds of crazy places! new things. old things. catalogs. blogs. people. magazines. friends. 3. i'd never turn down...a trip, anywhere! i love to travel and see things from a new perspective. 5. when i'm creating i always...have tunes or a movie playing and i must have snacks nearby. 6. i get excited about...summer, snow cones, traveling and chocolate chip cookies. 7. i steer clear of...snakes! eek!! ...my own creative release! i love creating new things out of old as well as capturing memories in photos and in albums. 9. one day i'll...be organized.